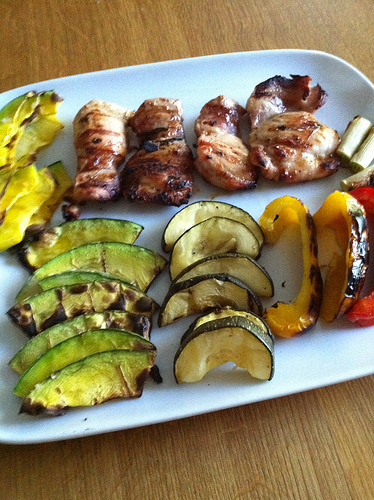 How to cook veggie’s on the BBQ – My first Squidoo lens! 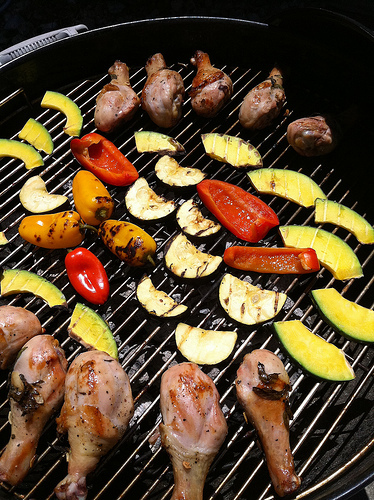 Simple pointers on how to cook vegetable’s outside on your favorite grilling platform. Be it a gas, wood, charcoal or solar grill. I have cooked potatoes, zucchini, squash and many different kinds of vegetables (some taken fresh right out of my wife’s garden) right on top of the grill. Many a guest have commented on how well this quick down and dirty BBQ treat taste. Even my dogs have taken a liking to BBQ’d veggies! First I pour a bit of olive oil in a plate, then sprinkle the olive oil with some of my favorite spices. Next I take one of the sliced of vegetables and use it as a pestle to grind the spices into a fine dust so they mix well with the oil. Finally I coat all sides of the sliced up soon to be uber tasty morsel and toss them on the grill. Frequently I sprinkle them with a bit more spice once they are on the grill. But I like my stuff spicy – your mileage may vary. 2 Cut each slice to less than 3/4 of an inch thick, You can cut your pieces in to long triangles or just plain round cuts that look like really thick potato chips. Its up to you, but don’t leave the slices to big or they might be raw in the middle when the grilling is done. 3. Coat them babies with olive oil or your personal favorite type of cooking oil so they don’t dry out. No spray penetrating oil please. Sure it might not stick to the grill but everyone will get sick. Never spay any aerosol cooking spray directly into your grill unless you have really good insurance and its the fourth of July – or you want to see some mighty gnarly fireworks up close and don’t mind a lot of pain..
Ok, this is my first Squidoo lens, so go easy on me about spelling vegetables in the url incorrectly. I was thinking at first, WOW it is going to be so easy to come up with lens names. doh.. Some rights reserved by Kei! Dropbox is a virtual private folder you can use across all your computers. This link will give you an extra 250 megs free. Maybe our beloved Gibson is going a little sideways. But check this out! Ok, why should you be careful when at work and using a company computer? Free things you can make at home!